As prices soared at this year’s Inglis Easter Sales in Sydney over the past few days, Flemington trainer Danny O’Brien remained patient and was rewarded late today with three bargain buys. O’Brien picked up a beautiful Foxwedge filly for just $40,000 (pictured), and he spent $70,000 each on Star Witness and Sebring colts. This follows his purchase of an outstanding Stratum colt on Day 2 of the sale for $250,000. “It’s important at the sales to remain calm and patient and stick to your plan. You do all the due diligence on each horse and set a value then it’s critical to stay the course,” O’Brien said. O’Brien stuck to his plan over the past few days and now his stable has acquired some lovely types at prices that won’t break the bank. 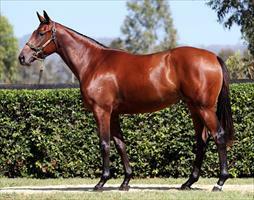 “I was very pleased with the outcome of today as the Foxwedge filly is a beauty as are the colts.